Petri nets provide a unifying and versatile framework for the synthesis and engineering of computational models of biochemical reaction networks and of gene regulatory networks. Starting with the basic definitions, we provide an introduction into the different classes of Petri nets that reinterpret a Petri net graph as a qualitative, stochastic, continuous, or hybrid model. Static and dynamic analysis in addition to simulative model checking provide a rich choice of methods for the analysis of the structure and dynamic behavior of Petri net models. Coloring of Petri nets of all classes is powerful for multiscale modeling and for the representation of location and space in reaction networks since it combines the concept of Petri nets with the computational mightiness of a programming language. 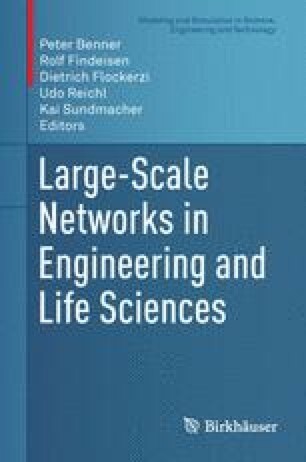 In the context of the Petri net framework, we provide two most recently developed approaches to biomodel engineering, the database-assisted automatic composition and modification of Petri nets with the help of reusable, metadata-containing modules, and the automatic reconstruction of networks based on time series data sets. With all these features the framework provides multiple options for biomodel engineering in the context of systems and synthetic biology. We thank Mostafa Herajy, Fei Liu, and Martin Schwarick for their continuous support in developing Snoopy, Charlie, and MARCIE. Mary-Ann Blätke and Christian Rohr were financially supported by the IMPRS Magdeburg through the Excellence Initiative of Saxony-Anhalt.